SPOILERS for the end of Captain America: Civil War! In the grand Marvel Studios tradition… there were end credits stingers at the end of Captain America 3. What exactly was the meaning behind the end credits epilogues? Sit back and let me tell you. Although this time I shouldn’t really have to. I thought it was pretty clear. The first coda – we see Bucky, the Winter Soldier, going back into cryo-stasis until they can figure out how to effectively de-program him. Buck doesn’t want someone to be able to do what Zemo did to him again. As the scene closes, we see that we are in Black Panther’s African country of Wakanda. The second brings us back to Queens and more specifically, to Peter and Aunt May’s apartment. May is trying to get more info out of Peter as to why he has some bruises and Peter makes up some story about school bullies, all while trying to hide some glowing device that is on his wrist. 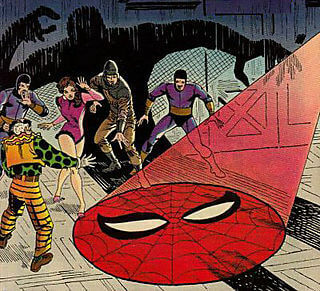 This device, made by Tony Stark, is a web shooter that has the Spider-Man beacon built in. It ends with the title card: Spider-Man will return. There you have it! What did you think of these end credit sequences? Excited for Black Panther and Spider-Man movies? Chime in below!